Where is this year going? It's already mid October and the Fall is in full swing (or Autumn for your guys back home). It's hands down my favorite season, not only for the colours and the crisp mornings, but because it's finally time to start wearing your more wintery wardrobe. I love throwing on an oversized sweater and heading out on the coffee run. I find that this season offer the most versatility in terms of what you can wear as it isn't so cold that you end up looking like an eskimo, and instead can opt for lighter layers and comfier pieces. There's also a great range of accessories out there and I think I may have just found my best one yet. For a long time, I've considered a watch to be a man's best friend and never leave the house without one. It's a great way to add a point of interest to an outfit, whether it be jeans and a tee or three piece suit. I always try to find that something different when choosing a watch and JORD Wood Watches ticked all the boxes. 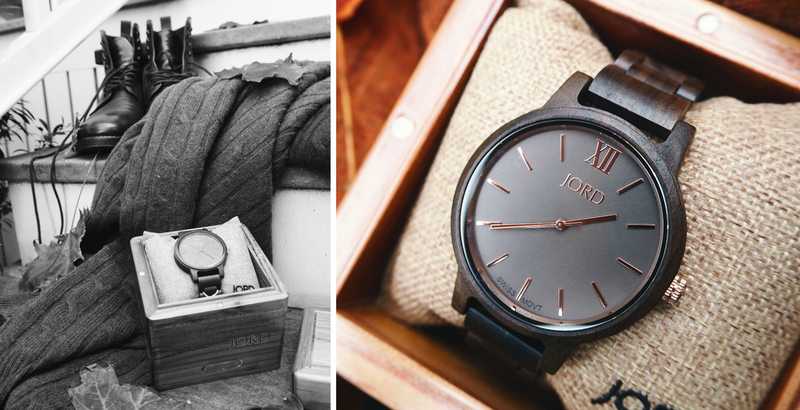 Made of dark sandalwood, this amazing timepiece is set to be my go-to accessory this Fall. The attention to detail by these guys is amazing, and the finish on both the watch and box is brilliant. It's always nice when a company takes the time to make the box just as impressive as the contents and I'm sure whether you're buyng this for yourself, or as a gift for someone else, you'll be just as impressed as I was. The watch itself is of a brilliant quality, yet relatively light so won't be weighing you down. It's the perfect size to be wearing on a daily basis, and you can customize the wrist size to suit you or a friend, when you buy it online. They also offer free shipping worldwide and have a variety Mens, and Women's Watches to pick from. I went for the Frankie in Dark Sandalwood with a Smoke Face. I'm obsessed with this smokey tone and the mix of the dark wood and gold detailing, made it an obvious choice for the season. I've already worn this watch most days and can tell it'll be featured one my Instagram quite a lot over the upcoming months. I highly recommend going to check out the collection over on the JORD website and if you like what you see, enter this exclusive give away! Simply head over to the contest page by clicking this link, for your chance to win a $75 gift-code to use off the watch of your choice. Also, all entrants will win a $20 code just for entering. The contest closes on November 13th - good luck!! *This post was sponsored by JORD Wood Watches. All views and images are my own.